OKLAHOMA CITY (October 4, 2016) – No one likes to feel left out, including students at recess. That’s why schools across the state are adding buddy benches to the playground. “I think it’s made a big difference in the awareness that the other kids have that someone might be having a bad day,” said Jane Johnson, principal at Garfield Elementary in Enid. Will Duran, a student at Garfield Elementary, was instrumental in the getting the buddy bench because he was frustrated about having no one to play with. “You sit on it, and someone might come. You never know,” Duran said. The 9-year-old saw a video online explaining how a buddy bench works and took the idea to community members. Thanks to the United Way and Leadership Greater Enid, 11 Enid elementary schools now have a buddy bench, and the idea is catching on across the state, from Enid to Weatherford to Piedmont. The benches may look slightly different from place to place, but the purpose remains the same. So what exactly is a buddy bench? Watch below. 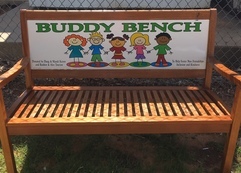 If your school is interested in getting a buddy bench, click here for additional information.